The Lyallpur district in the North West Frontier Province was a conservative place in the 1920s. If you came from a good family, the thing to do was to become a lawyer or something equally respectable – not throw up your studies, get on a train to Bombay and hang around studios on the pipedream of becoming an actor. This is exactly what a young man named Prithviraj Kapoor did in 1928, to his father’s vexation. “A kanjar - is that what you want to become?” the senior Kapoor bellowed at his errant son. 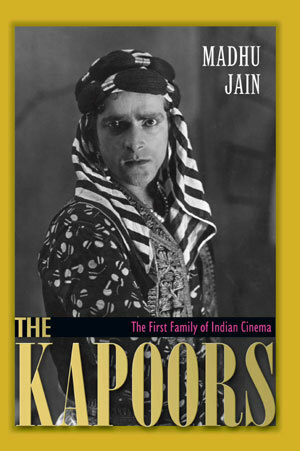 Seventy-seven years later, as Madhu Jain points out in the introduction to her fine book The Kapoors: The First Family of Indian Cinema, "Each decade in the history of Indian cinema has had at least one Kapoor playing a defining part in it." That’s a lot of “kanjars” from one family. And in a neat little twist, the flag of this once-conservative clan has been held aloft in the 1990s and 2000s by women - Prithviraj’s great-granddaughters Karisma and Kareena. This is an enormous, daunting canvas, and Madhu Jain’s approach to her memoir is the sensible one. Rather than attempt an integrated, steadfastly chronological account of the khandan, she writes The Kapoors as a series of mini-biographies. Separate chapters are dedicated to the life and career of each major member of the family; consequently, while there is some overlapping, this structure keeps the focus firmly on each personality and enables the reader to appreciate some very dramatic individual stories. Here you’ll learn about young Prithviraj being hand-picked, swayamvar-style, from a line of studio extras by a top actress to play the male lead; about his early films and his love for the stage, out of which grew the theatre group Prithvi. Here you’ll get an insight into the personal demons that spurred Raj Kapoor to become Hindi cinema’s greatest showman, the influences that lay behind Shammi’s screen persona (one of the most original in Bollywood history), how Rishi Kapoor survived the Bachchan Era, and why his brothers’ careers fell by the wayside. Importantly, this is no hagiography. Jain doesn’t shy away from holding a magnifying lens to the family’s less savoury side. She is especially sharp in noting Randhir Kapoor’s seemingly ambivalent attitude to his father – "his remarks reveal that he may have wanted a father more ordinary" – and uses this to dissect the burdens placed on the younger generation by the giants who preceded them. The Kapoor weakness for alcohol and food, and the subsequent tendency towards corpulence, are also discussed at length. As are some disturbing individual traits, like the “in your face faux-humility” displayed by Raj Kapoor in entering a room slightly bent forward, hands folded, saying “Mujhe Raj Kapoor kehte hain” – despite knowing very well that everyone there was in awe of him. But equally importantly, Jain’s handling of these flaws is frank and matter-of fact; she doesn’t gloat or get voyeuristic. In her foreword, the author mentions that Shashi Kapoor’s advice to her when she started the project was to be honest. "I suppose that was a carte blanche to look at the less flattering side of the Kapoors as well as their achievements." She’s certainly succeeded. In less than 400 pages (too little space, one might have thought, to do this subject justice), The Kapoors paints a balanced, informative and very entertaining picture of a fascinatingly multi-dimensional family. “We are like the Corleones,” Randhir Kapoor preens at one point. This is a not fully comprehensible claim – but whatever the resemblances, the Kapoors are certainly much more colourful than Don Vito and his clan. Personally, I find Prithviraj Kapoor and Shashi Kapoor to be the two most interesting members of the clan, perhaps mostly because they've been less written about than Raj and Shammi. And I've always had a huge crush on Shashi (Umm not in his contemporary avatar though). Oh, Prithviraj Kapoor was a very interesting personality by most accounts - the author makes no bones about finding him the most intriguing member of the family. Shashi too, yes: I always found it interesting how he balanced his mainstream and "parallel" careers in the late 1970s and early 1980s - playing Amitabh's sidekick/foil in one set of movies and simultaneously producing/acting in non-commercial films like Junoon, Kalyug and Vijeta. The book mentions that Raj Kapoor once sarcastically told him "Tum toh taxi ban gaye ho" - meaning he was indiscriminately signing up with any producer who approached him. It does sound like quite a family and quite a tale. Coincidentally Jai, today also happens to be Raj's birthday. Yes, just realised - strange how these things work out. And I posted it around midnight too! So the photo on the cover is Prithvi Raj Kapoor? For a moment I was wondering what is Tushar kapoor doing there! Mridula: aarrghh! You are banished! Banished from this post! I studied in Tata Institute of Social Sciences, Bombay for two years.. and the RK Studio was a short walk away.. what?! you are not gay?! Re Prithviraj's picture, I recall seeing Sikander and was surprised to see how close Shashi looked like him from certain angles. But from some angles, Shammi was exactly like his father. Prithviraj was the first legit hunk of Hindi cinema. I just recently watched a (rather low quality) VCD of "Sikandar-e-Azam", with a middle aged Prithviraj as Porus. Good stuff that (Dara Singh as an "Adonis" like Alexandar). Easily the first family of Indian cinema. Even I had a simply enormous crush on Shashi, though only in a remote way, since by the time I was the age to develop crushes he was well on his way to corpulence, I think. By the way, does the book talk about the minor characters in this saga, like Shashi's sons, or even Sanjana, though she is by no means 'minor', having got most of the brains of the family in her generation? Isn't it amazing and unbelievable that she and Kareena/Karishma are first cousins? Sonnyboy: kanjar is a derogatory Punjabi word used to denote prostitutes, eunuchs or pimps. I think it's time for you to confront your father. Or at least go to Bollywood and hang around studios. Quizman, Sunil: thanks. No, not much about the musical ear; even Mukesh and Shankar-Jaikishen get only passing references in the 'Raj Kapoor' section. Smits: the word you should have italicised is "not", not "are". Shrabonti: there's very little on the minor Kapoors - the book being mainly about the Kapoors as an acting dynasty. Even Randhir has to share a chapter with his brother Rajeev. Your crush on Shashi being "in a remote way" may have had more to do with the fact that you never knew him personally, plus he was 40 years older than you, than with his increasing corpulence. During a conversation with Manna De a a couple of months back (1, 2, he waxed eloquent about the pains Raj Kapoor took while creating songs for his film. Manna-ji said that Raj Kapoor's sense of music was, in his mind, unparalleled. He said he has not seen such a meticulous director as far as songs were concerned. Quite interesting that Ms. Jain did not concentrate on that aspect of the Kapoors. Their relationship with musicians, lyricists leading to sessions lasting all days/nights are very well known, as you are no doubt aware. Do you think Jain had to compromise on certain topics in order to get the whole family covered in the book? This post was very interesting. I'd love to see more like it. I finally read, rather leafed through most of the book. I found it very badly written. Which is why despite my best intentions I had to skip large chunks of the book to come back to it later. Too anecdotal, repetitive, lacking any contemporary insight of their movies. The 1001 interviews could have been supported with some archival research & views of those people who may have been hard done by the first family. A subject as fascinating deserves better critical analysis. 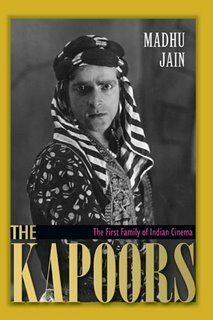 As somebody having to learn all about Bollywood as an adult and from far outside, I was delighted with this book - I have been fascinated by the Kapoors ever since I found out about the family about 5 years ago, and in love with Shashi since 1970, as I knew him from Merchant Ivory movies. This is one of few books that are intelligent but not academic monographs, and as you noted, Madhu Jain is a pretty straight-shooter, and clearly doesn't feel restricted to writing flattery of people who have talked to her. I learned a lot and put a lot of scraps of information together. I discovered your blog a month, reading them in between my full time job, my 2 year old daughter, hence the late comments!!! Ashwini: no problem about late comments (it's good to know someone is trawling the archives!) but which Shashi Kapoor pic are you talking about? That's Prithviraj Kapoor on the book's cover. Great review. Definitely want to pick up the book. Never did it for any of the filmy folks, but you have written a fab review. Like the title of this post - Kapoors - Bollywood first family. It was like they have the full authority over Bollywood world. But now this authority is loosing up and only one name is last and he is - Ranbir Kapoor. Surprised to see that how Kapoor's male member gave up this profession. When I though about Kapoor's male than only one name comes to my mind and i.e., Shahid Kapoor.